Successfully Added VKWorld Z2 Seniors Mobile Phone - Loud Speaker, Large Keys, Intelligent Speak Function, Dual SIM, Camera, Micro SD Slot (Red) to your Shopping Cart. Remember when cell phones we used for making calls rather than invading our lives with media updated, news alerts and unwanted distractions, VK World does and now if you long for those days again you can get them back with the VKWorld VKZ2 flip phone. Adopting a classical style and simpler user system this Flip Phone from VK World is a reminder of simpler times. It does exactly what you want from a phone, nothing more, nothing less. Focusing purely on what you need a phone to do this no-frills cell phone doesn't complicate life with Apps, web surfing or touch displays. Unlike modern smartphones, which can be a jack of all trades the VK World VKZ2 is a master of one - making and receiving calls. 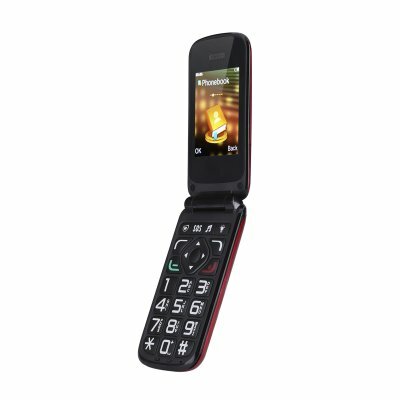 Packed with all the necessities you need, calendar, built in light, quick dial contacts, SOS dialing, messages and of course calling functions this flip phone makes it easy to set reminders, make calls and send messages. Intended to make using a cell phone simpler and more accessible the VKworld VKZ2 has large easy to read and use buttons, a clear bright display and loud built in speaker. So you will hear any incoming calls or alerts even if the phones in a different room or tucked away ion your pocket or bag. An assistant dialing feature means that when you dial a number the phone will audibly sound out each digit you press making it a doddle to use even for those who struggle with their sight. Specially designed for the elderly or those with disabilities this classic flip phone is perfect aid for those who want to keep connected when out and about. It benefits from an 800mAh battery that brings plenty of talk time and up to two days of standby so you won't need to charge it every day. The VKWorld VKZ2 flip phone comes with 12 months warranty, brought to you by the leader in electronic devices as well as wholesale cell phones..